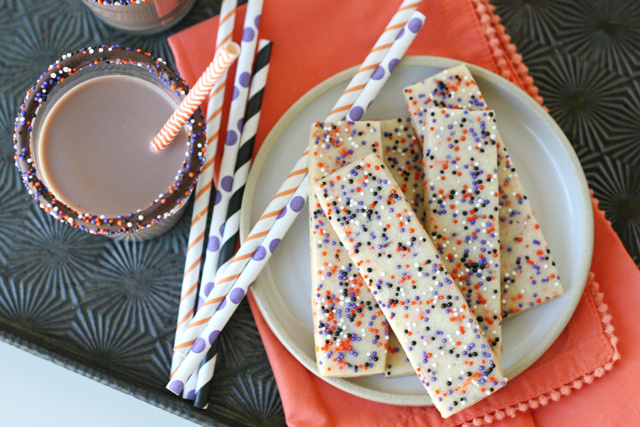 These easy and delicious Halloween Sprinkle Cookies are so good it’s almost SPOOKY! Cookies and milk… what could be better? This post was created in partnership with MilkPep. I like to baked homemade treats at least once a week and have a plate ready when my girls get home from school. I love the excitement on their faces when they see a special treat waiting for them! After a full day of school, enjoying a snack they love seems to help the transition into the rest of the day… often filled with sports, homework, and chores. 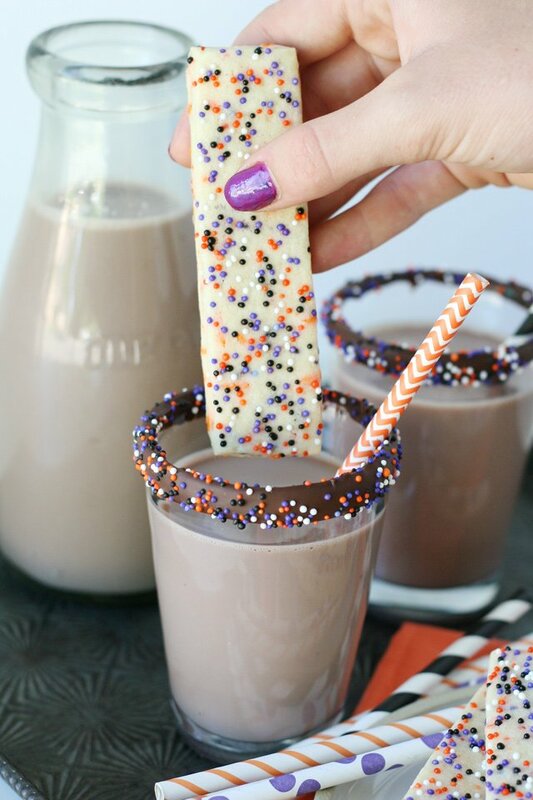 This week, when my girls came home to these adorable Halloween Sprinkle Cookies and chocolate milk waiting for them, their tired faces lit up! 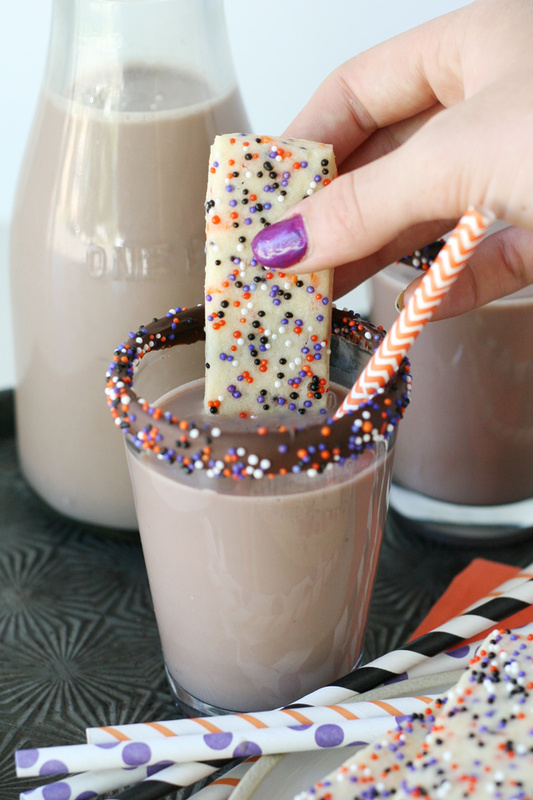 I think chocolate milk should be considered “The Official Drink of Halloween”… it’s sweet and fun, just like Halloween! And knowing that chocolate milk has the same essential nutrients as classic milk, chocolate milk is a treat I feel good about. Each 8 ounce glass of milk contains 8 grams of high quality protein as well as 9 essential nutrients to help fuel my family. 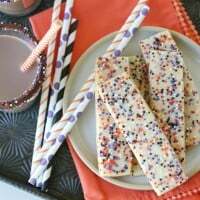 This recipe starts with my Perfect Sugar Cookie Recipe, gets a fun helping of sprinkles, and then I cut the dough into thin strips, perfect for dipping in milk! 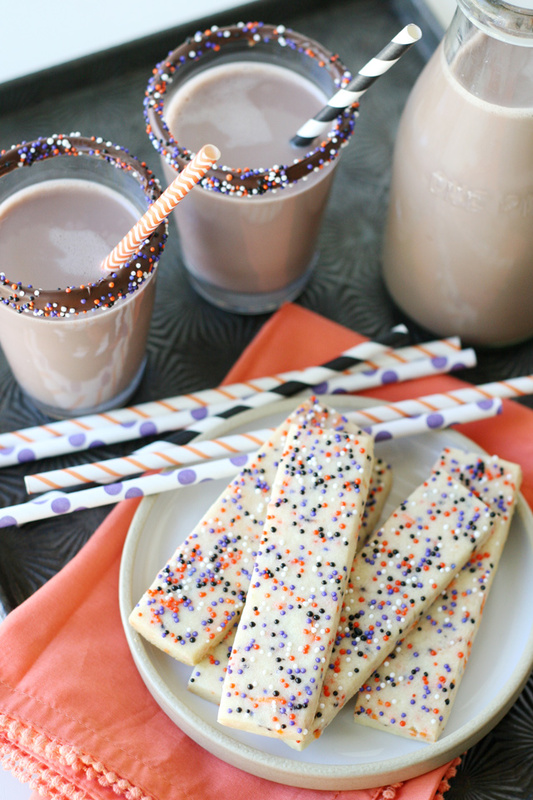 Add sprinkles and chocolate milk to your Amazon shopping list and you’ll be ready to make a treat perfect for any Halloween party! This is my tried and true sugar cookie recipe with the addition of sprinkles! Add 2 tablespoons sprinkles and blend just until incorporated. Scoop the dough out onto a work surface and form into two large balls. Avoid working the dough with your hands too much, as this may cause the colors of the sprinkles to bleed. Lay a large piece of plastic wrap on your work surface. Place a ball of dough on top and press the dough down just a bit to flatten. Top dough with another sheet of plastic wrap, then roll out the dough (between the two sheets). This method eliminates the need for adding extra flour (as might traditionally be done). Once the dough is your desired thickness (about 1/3 of an inch) remove top layer of plastic wrap and sprinkle the entire top surface of the dough with sprinkles. Gently roll your rolling pin over the sprinkle covered dough to embed the sprinkles into the dough. Cut out cookies as desired. I used a large knife to cut the dough into 1"x4" strips. Place similar sized cookies together (at least 1/2 inch apart) on a baking sheet lined with parchment paper or a silpat type liner. Place entire baking sheet of unbaked cookies in the fridge for 15 minutes or freezer for at least 5 minutes. This step helps prevent spreading. Cool on the baking sheet for 1-2 minutes, and then move to a cooling rack. Once fully cool, store the cookies in a sealed container. The baked cookies will remain fresh (when stored well) for at least a week. Sprinkles - I used Halloween non-pareils in black, orange and purple. As an alternative, you could use a fun mix like THIS (I'd just remove the large balls). I added 2 tablespoons of sprinkles to the dough itself, and then added additional sprinkles on top (without measuring), as needed. Disclosure – I created this recipe in partnership with MilkPep. Partnering with brands I love allows me to provide you with high quality content at no cost to you. I only work with brands I use and love. All images, text and opinions are my own.